Pictures are taken at PNBAA activities. They may be publicly used in the newsletter, website or other medium for the benefit of this organization. PNBAA may choose to share an event attendee list with paid event sponsors to facilitate mutual networking opportunities. That attendee list is limited to Name and Organization (i.e. name tag) only. NO ATTENDEE CONTACT INFORMATION will be shared, it remains private to PNBAA. PNBAA is excited to announce the reappearance of a maintainers luncheon educational program in the Pacific Northwest. Aircraft maintenance technicians are encouraged to take part in this valuable opportunity to connect with industry colleagues and prominent aviation equipment and service suppliers. This spring program features a relevant dialogue with Todd Lindsay, Rolls-Royce Regional Customer Manager. Attendees can expect to walk away with an advanced understanding of their support network when encountering an engine maintenance event. Please join us at the beautiful CBAir Hangar at Boeing Field and thank the program sponsor, Rolls-Royce. Online registration is FREE starting mid-April and appreciated by May 14 if feasible to support the catering order. A boxed lunch and beverages will be provided. If your organization would like to be recognized as a sponsor of PNBAA's future engagements, please contact the organizing committee using the website's "Contact Us" form. Thank you for your continued support of PNBAA's aim to champion aircraft operators and those who support business aviation within the Pacific Northwest. Save the Date - Additional details will be provided in the monthly newsletter and on this event site. Each year the PNBAA community enjoys a friends and family barbecue luncheon on Boeing Field in advance of the Seafair Weekend Festival. Plan on tasting a gourmet catered barbecue lunch, smelling a whiff of the Blue Angels afterburner and visiting with 200+ professionals. The organizing committee requests your help finalizing a catering plan, register free on this webpage by Sunday, July 28th. If you are not an annual PNBAA member, consider joining your peers now in strengthening this regional business aviation community. Your membership helps fund our future programs, youth scholarships and member grants. Save this date! Golfer registration and sponsor package requests will be available June 3rd 1:00 pm PDT (not prior). Welcome to the 11th Annual PNBAA Golf Tournament! This year we will once again gather to develop professional relationships and have fun raising proceeds to support scholarships and educational programs. There will be plenty of room for all interested golfers and sponsors to participate as we will occupy both courses at The Golf Club at Newcastle! There will be a longest drive and closest to the pin prize for both men and women on the designated holes. The winners are each awarded a prize at the luncheon. Hole-In-One Contest - There will be a Hole-In-One contest for all golfers. The golfer who makes a hole-in-one at the designated Par 3 will receive a special, high value prize. Additional prizes will be given for any hole-in-one made on one of the other Par 3 holes. Mulligan - Each golfer will have an opportunity to purchase one mulligan ($5 cash) at registration which can be used for any shot, EXCEPT contest shots (i.e. long drive, closest to the pin, hole-in-one). Cheat-for-Charity - All participants will be given an opportunity to purchase a Cheat-for-Charity at designated holes for $20 cash per team each hole. It allows the foursome to proceed to the 150 yard marker to take their first shot. Purchase raffle tickets for prizes given away at the end of the awards ceremony: One ticket = $5 cash or five tickets = $20 cash. Trade a little cash and potentially take home prizes worth hundreds! Each golfer (excluding Rusty Putter contest) will receive a $50 Nike/Titleist gift certificate to spend that morning, The store will be open 10:30 am - 12:30 pm at the Carnoustie suite at the practice facility. 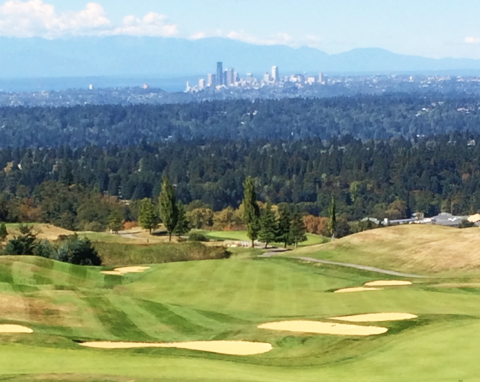 If rental clubs are needed, please contact Mark Rashell at Newcastle (425.793.5566) to reserve before September 16th. Cost is $60 + tax. In 1995 Brant Dahlfors, Herv Hodgson and Sue Carroll came up with the idea to host a golf tournament to garner more interaction between flight departments operating at Boeing Field. The first tournament, held in 1996, was hosted by Learjet and Westar Insurance Managers. During the next 13 years of the tournament, Learjet morphed into Bombardier and Westar continued into HUB International Northwest. Both continued hosting the tournament annually until 2009 when the tournament was turned over to PNBAA in an effort to generate even greater participation within the Northwest aviation community.